A garter worn by King Charles I on the day of his execution has been bought by a private collector for £4,400. The blue ribbon belonging to the son of James VI of Scotland was sold at Shapes Auctioneers in Edinburgh on Saturday. After the English Civil War, Charles was found guilty of treason by one vote and was beheaded at Whitehall in 1649. During his reign as King of England, the Fife-born monarch caused unrest north of the border by trying to force a new prayer book on the country. Charles was said to have removed the garter ribbon before laying his head on the block on specially constructed scaffolding at Whitehall. 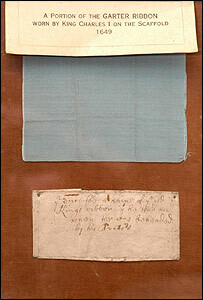 A note attached to the ribbon, dating back to the 17th Century, states that it was worn by him on that day. A spokesman for Shapes Auctioneers said: "In the same way that souvenir hunters collected items immediately after the execution of his grandmother, Mary Queen of Scots, there was a hasty gathering of material immediately after the execution of King Charles I. "These included blood-stained garments and were kept to stress a belief that the monarchs were holy martyrs." Auctioneer Paul Howard said: "There was a lot of interest in the item, with bids made over the telephone and by people in the auction house. "A number of museums had also expressed an interest."